So I’m sharing this with the world. This is my Monday. Which looks like my Tuesday. Which looks like my Wednesday. And, as a matter of convenience, I’ll leave it right here as an answer to The Question which every SAHM will inevitably be asked. 4:00 am : I am dreaming of velociraptors. They are squawking louder and stalking closer and it takes a while, but I start to travel the brain-tunnel from dreamworld to reality. “SQUAAAAWK!” Ben is walking around his crib with a blanket over his head, roaring happily and soaked with pee. 4:05 am: Costume change. My son should join the circus. To prevent a trapeze-off-the-changing-table disaster my bright idea was to hand Ben a tube of Buttpaste. Here’s an exciting milestone! Ben can open Buttpaste. With his mouth. 5:15 am: Rocked and fed, Ben is back asleep in his crib. 5:30 am: Ian’s alarm goes off. Baby wakes up. I contemplate multiple crimes against my husband as I scoop up my baby raptor and head for the kitchen. I. Need. Coffee. 6:00 am: I’m sitting in the Playroom bed with a Dr. Suess book in my lap and I have no idea how I got there. I don’t think I was sleeping, but alien-abduction is unlikely. Some time is definitely missing. A head pops out from behind the toy bus. “TADA!” Ben squeals, then falls over and hits his head on the floor. The poor creature is genuinely distraught and all I can think is coffee. 6:30 am– Ben has a golf ball in his forehead but staring at the fan seems to make him happier. “Fan? That’s a fan!” The magic in his eyes is undeniable. Our den is Disneyland. Yawn. 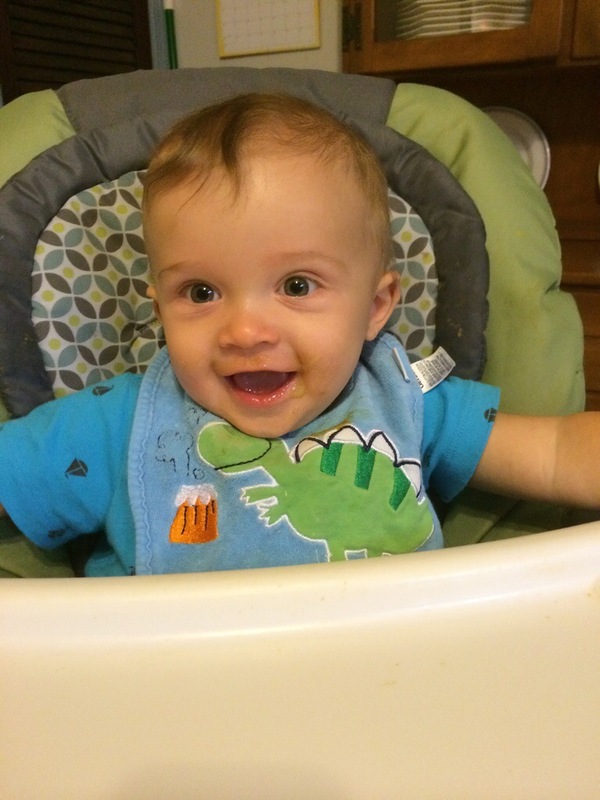 7:00 am– Baby banging on a highchair tray, babbling something that means WAFFLE but sounds nothing like it. I find my coffee in the microwave, which is really convenient. I zap it. 7:01 am: So it was yesterday’s coffee. ACK. 8:00 am-Dishes–check. Dogs–fed. Floor is swept. Ben’s smashing his sippy cup against the empty tray, so I unsnap the chair. Remnants of waffle are in his hair, fat rolls, and the seat. “More!” he says with a toothy grin. More, indeed. He literally ate nothing. 9:00 am– Naptime! I am going to find my coffee. For real this time. But wait…maybe I should nap! 9:30 am am: Phone rings: Mother-in-law! “…well, honey, you should get to that nap. You looked so tired the last time I saw you.” END CALL. 11:15 am Baby is sweating and panting and passerbys are staring because who the heck forces a pitiful baby into a wagon when it’s 100 degrees outside? 11:30 amPlayroom! Ben is walking-walking-walking and I start to cry. He’s growing up so fast! Go to the bathroom to grab a tissue—there’s my coffee! Gross. The cream has separated completely and is swirling around like a hurricane at the top of the drink. Did the microwave do that? That’s kinda weird. 11:45 amStill in playroom googling “Can a microwave hurt my baby.” Yes, it can–No, it can’t—Yes, definitely it can. How can I live without a microwave?? Damn you, Google. 12:00 pmI microwave Ben’s snack and get him ready for the YMCA pool! Baby in swimsuit. Mom in swimsuit. OMG I AM SO FAT. I SHOULD START EATING CLEAN. Mental note: Publix after pool. 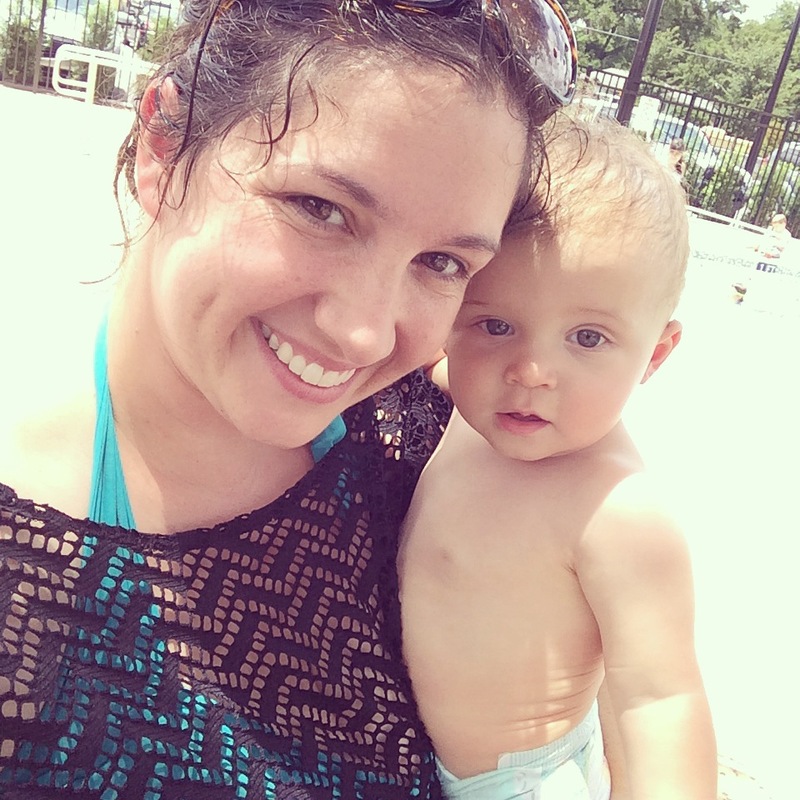 1:00 Pretty sure I’m the biggest mom at the pool, but Ben doesn’t seem to notice. Whatever, my kid is cuter than yours. Splash-splash-splash-THUNDER. 2:30 Strolling through Publix in my bathing suit googling Clean Eating Recipes. Ben LOVES grocery stores. At check out I realize this one meal is the same price as my entire weekly budget at Aldi. Screw it. I offer a red-faced apology and ditch the cart. 3:30 Baby in PacknPlay and turn on Fragglerock. He’s going to put himself down for a nap because that’s what the pediatrician said should happen. 4:30 Ben is not napping and I am watching Fragglerock. I don’t remember it being this….deep? 5:00 Time to cook dinner or something. Ben wants a nap now, but I’ll be danged if he gets one because bedtime is in two hours. How can I keep him awake? Bathtime! 5:30 Splashing around the tub with duckies and bubbles and soap and Tupperware. The water is good and sudsy when baby discovers he can DRINK from the Tupperware. Coughing up bubbles. Bathtime over. 6:00 Hubby will be home in an hour. I am on the couch, still looking for recipes. Ben is chewing a duck, back in the PacknPlay. I ponder whether this is the equivalent of kennel-training my baby. Serious mom guilt. Ian reading Goodnight, Moon. It’s gonna be a Stouffer’s night. I open the microwave. Love this!! I hate the question “what do you do all day?” Drives me crazy! But I wouldn’t have it any other way. Love being a SAHM! The coffee digression play by play is HILARIOUS. And oh so true. I am for real LOL-ing at “Can a microwave hurt my baby?”…perfection. You know how it is!!! Reflecting on my time with our babies! Some things just don’t change. Just wait till you have another little dinosaur! LOL – STILL heating and reheating my coffee ………. I love this! It is right on, and the questions (and judgement) are worse when you add homeschooling to it. We have to work in class time for three school age kids while trying to keep a 15 month old entertained and house training a puppy. Fun times.